Youth mentoring, active in human rights, 11-time champion, Hall of Famer (who has never visited the Hall of Fame in Springfield, MA) describes none other than Bill Russell. 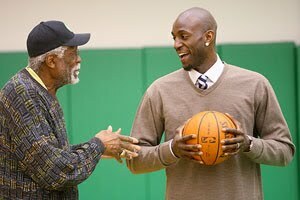 The former Boston Celtic has been living longer than he earned a living lacing them up yet it's those years in his life where he can have the most effect. The saying is were all big kids. Why doesn't that apply to the elderly as well. 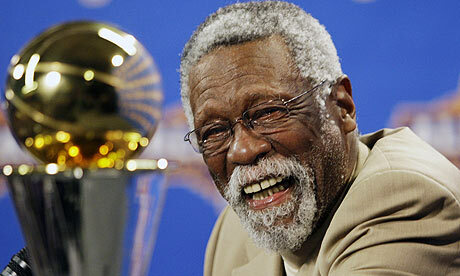 In his mid 70's Bill Russell is still being a kid while being a stand up man and true to Bill Russell. His wisdom and experience is something each and everyone of us could use a little dose of from time to time. William Felton Russell will be honored with a statue soon erected in Boston, MA. The Boston Celtic Shamrock Foundation and the Bill Russell Legacy Committee will fund the project. For a man to be honored by the sports Hall of Fame and never set foot in the building you have to believe him.